This home boasts 8 bedrooms, (3 of which are designer suites), 5 full baths, hot tub, volleyball court, and a games room featuring pool table, shuffleboard, board games and 42” wall mount TV. 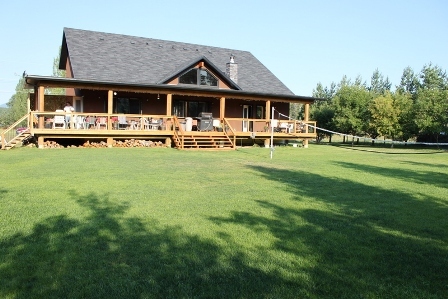 Located just off HWY 3 in the village of Jaffray, between Fernie and Cranbrook, you will have your choice of 3 ski hills, a variety of challenging golf courses, numerous lakes for waterskiing/fishing, and quad/dirt bike trails for recreational use. If it’s snowmobiling you’re looking for, that can be found here too. 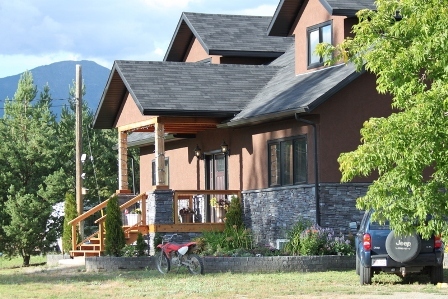 This wonderfull vacation home is the perfect destination for a family or group of friends to experience all that the East Kootenay region of British Columbia has to offer. This home can potentially sleep up to 20 people. Washer and dryer are located in basement utility room. This luxurious home is 4300 square feet of larch hardwood flooring with radiant in floor heating. A Grand fireplace is located in the great room for those cozy winter nights. 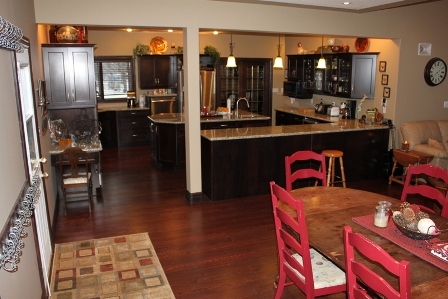 This home was designed for large groups, with its open concepts, additional eating areas, and friendly atmosphere; you will rent this home over and over. The back yard is great for bocci, volleyball, Badminton, and team building games and events. also located in the back yard is the pump house, which has an exterior outdoors hot tub and a ½ bath with a shower, for a quick rise after a relaxing tub. Located just off the kitchen, through the patio doors is the B.B.Q on the deck, which spans the length of the cabin, with a beautiful view of the mountains. We cannot count the morning coffees, days and nights spent socializing with friends and family on this deck. Enjoy a hot tub under the stars. Great for relaxing in after those powder filled days at Fernie ski hill, or after a breath taking round of golf at one of the many courses in the area. 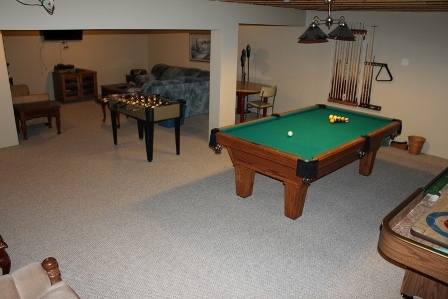 Located in the basement is another spacious full bath with oversized shower, 4 bedrooms, a well-equipped games room featuring, pool table, foosball, 42" TV and Shuffleboard. The Great room located off the main front hallway and the kitchen has a 60” satellite TV and a beautiful fireplace that will heat up to 2500 square feet. 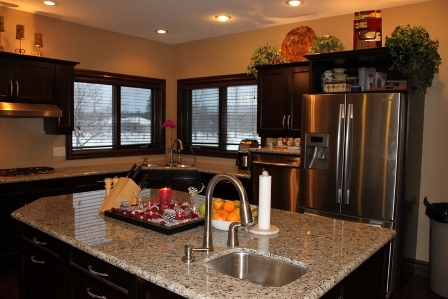 The home is equipped with wireless internet, for surfing the net or getting the latest update on ski conditions. Enough seating to accommodate large groups. This home has nothing but atmosphere; you will enjoy your stay and be sure to tell your friends and family about our place. 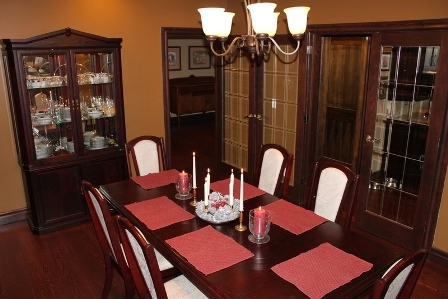 Additional eating area located in the formal dining room just off the kitchen through the double glass doors. The 1st bedroom is located on the main floor. We call this the Master suite…because it’s so massive. It has a king bed and full en-suite. 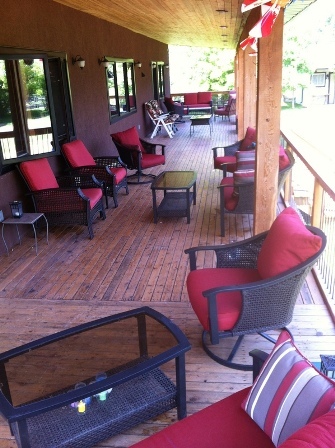 Access to the deck and quaint sitting area through private door. A deep tub to soak in and a large shower with body jets and a rain head. 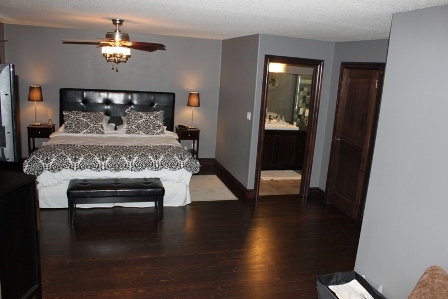 The 2nd bedroom is also on the main floor and has a king bed and wall mount TV. Smaller than the rest but still roomy. 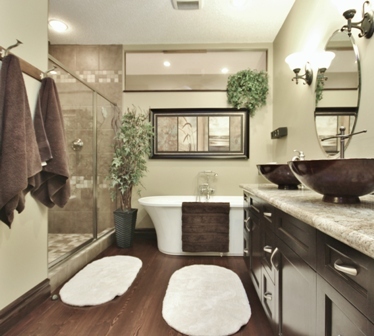 Just off the second bedroom is a full bath with jetted tub. Up the stairs and to the left is the 3rd bedroom. I like to call this the Tuscany Spa room. 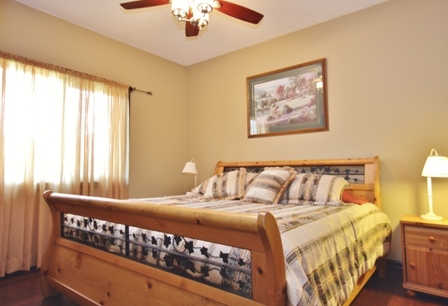 Located in the dormer is a cozy queen bed. From here you can watch a little TV on the 42”, before drifting off to sleep. This room is equipped with 2 plush theatre chairs, a desk, and a mini fridge. The ensuite has a large jetted tub, roomy shower with body jets. The 4th bedroom located at the top of the stairs. It has a beautiful king bed with a 42” satellite TV. 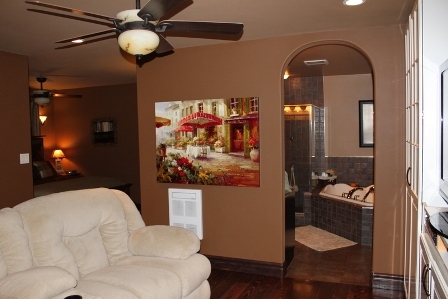 The TV is on a swivel, so that it can be viewed in the sitting area also. This en-suite has an oversized shower with a bench for the ladies, body jets, telephone shower and a rain head. Let this shower refresh and reenergize you.